A pair of beautiful crisp white 100% cotton pillowcases, great for a personalised engagement or wedding gift, or even an anniversary present. Perfect for a 2nd Wedding Anniversary gift, these are beautiful crisp white 100% cotton pillow cases that will go with anyone's bedroom colour scheme! These pillow cases also make the perfect gift for any occasion, Birthdays, Weddings, Valentines, Christmas, Anniversary, Easter, Mother's Day, Father's Day, or if you just want to treat a special family member or friend! Or why not even treat yourself! 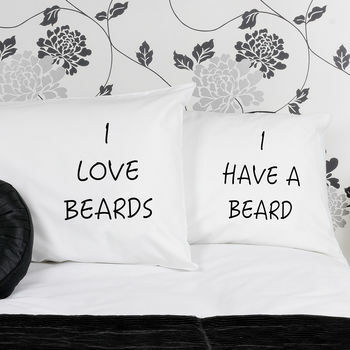 The text on our pillowcases is applied using a heat transfer process, these are not embroidered. Should you require alternative colour text other than black please do send us a message to let us know! We are able to provide customised products within very short lead times as corporate gift's. To discuss your corporate gift needs, enquire about product personalisation and place your order please contact our corporate gift service team on 0344 745 9626. Designed and printed by Andrea fay's.